Two of my recent blog posts have received some attention by real estate agents from around the Country, and so this week has brought me more interaction with my peers than any week that I can remember for a long time. While the feedback that I have received has been varied, I have noticed a positively common theme from real estate agents from many different markets. I am hearing reports of low inventory. At face value, this is not just good news, it is the very news that we have been waiting to hear. Falling inventory is a major "next step" in the return of the housing market. But sadly, thus far it is just unsubstantiated positive sentiment from real estate agents who have a vested interest (as do I) in seeing a housing market recovery. As a real estate agent in Tallahassee, I too would love to see things return to "normal." I too have seen the number of homes for sale in Tallahassee drop from nearly 5,000 in 2007 to less than 2,500 today, so I could also be sending out the positive vibe on the housing market. But I am committed to providing the kind of information that my customers need in order to make the very large decision to sell a home or buy a home in Tallahassee. My reports show falling inventory, but they also show that home sellers who have failed to sell their homes in recent years (as a statistical group) are growing far larger than our existing inventory. Are other real estate agents seeing this in their markets? My reports also show a rise in foreclosure activity, so I know that the next few years will see an increase in the number of distressed homes for sale in Tallahassee. This shadow inventory of homes is also larger than our current inventory. Thus I believe it would be nothing more than false prophecy for me to just report falling inventory, because the bigger picture shows something different entirely. So here's my challenge to real estate agents around the Country: Substantiate the condition of your local real estate market. I want to believe that the first signs of recovery are in place, and I respect the heck out of some of the people in Virginia and California who are saying they are low on inventory. But I am asking for more than just your "feel," I would love to see a non-spun version of a housing market recovery. So if you are willing to take up the challenge, I am willing to help spread the results of your hard work (you will have to do a lot of work to discover the true condition of your real estate supply and demand. You can send me, through twitter, a link to your findings, and I will help spread the word. My @HousingReporter profile on Twitter has over 165,000 followers, and I publish daily reports about the housing market from all over the world. In Tallahassee, our units sales are down to 50% of the historical norm, so my instincts told me to look for (as Paul Harvey would say), the "rest of the story" regarding falling real estate inventory. Go to your MLS and determine the number of homes that have failed to sell since January of 2008. The Tallahassee MLS had something like 13,000 failures in its system, so don't expect this to be a tiny number. Also, look at any non-sold home leaving the market as a failure. Not just "expired" listings, but withdrawn ones and cancellations too. Many agents game the system and they cancel listings right before they expire. Then from your MLS, use all the sales during that period of time as a cross reference to reduce the size of the failures list. If your MLS is anything like the MLS in Tallahassee, there will be tons of duplicate listings for you to sort through. Some of the failures will actually just be duplicate entries in the MLS that we not marked as sold (if you put a listing in the MLS in more than one configuration, then you close one when it sells, and cancel and duplicate entries). Then look to your local county property records and find any homes that have been sold or transferred outside of the MLS In Tallahassee, only 75% of all sold homes are recorded in the MLS, so there are many more to find at the Leon County Property Appraiser's office. Once you finish cross referencing all the duplications and successes out of your list of failures, you will have a final inventory of all failed home listings where the majority of home sellers want to move. Their motivation for moving was not strong enough for them to lower their asking prices to levels that buyers would accept, but once values return, so too will these sellers. This "forgotten inventory" of homes is the future supply, and had our market retained values, these would be current supply. 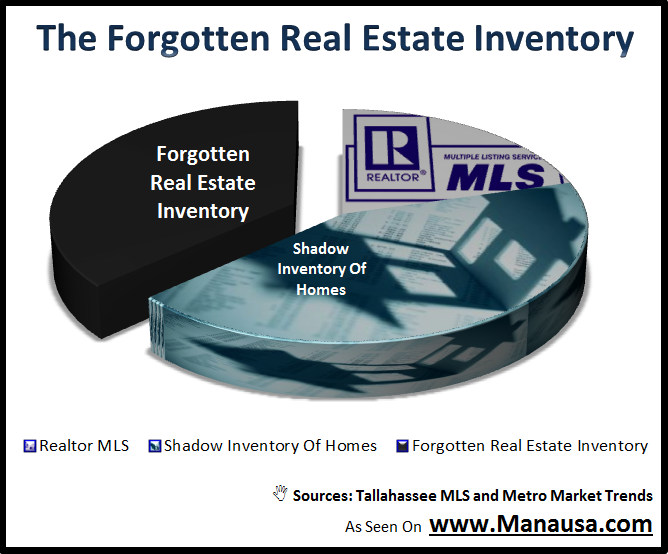 The forgotten inventory of homes in Tallahassee is more than double what our current active inventory shows in the Tallahassee MLS, and for this reason, and do not think the falling inventory numbers are going to have the impact that we all are hoping for. So, real estate agents everywhere, step up to the challenge and show us where your market really is. I bet there are some markets out there with true recoveries underway, I just want to see some real evidence, not just the normal chirping real estate agents who have never changed their tunes.